You walk in to a striking illuminated cast iron and glass staircase greeting you that leads to the main dining room and bar. The main dining room features a rustic mix of reclaimed beams and bricks, biscuit tufted Italian leather banquettes and booths, traditional tables and two trattoria style communal tables. The curved, serpentine shaped bar is made of illuminated onyx and a striking black Italian marble top. Everywhere you look you see nooks and crannies that allow a couple to escape for an intimate second, yet still remain part of the greater environment. Down stairs you will find a private dining room featuring state -of-the-art media capabilities and it’s own private bar – perfect for parties and work functions. 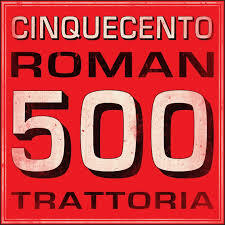 Cinquecento will also offer one of the South End’s most pleasant outdoor dining spaces tucked away from the hustle and bustle with an idyllic 60-seat patio open during the warmer months.